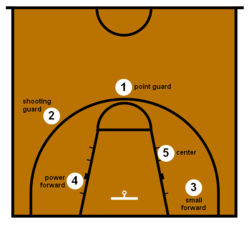 The five basketball positions normally employed by organized basketball teams are the point guard (PG), the shooting guard (SG), the small forward (SF), the power forward (PF), and the center (C). While these position names are still used, most modern teams use a point guard, two wings, and two post players, or use no specific positions at all. The rules of basketball do not mandate them, and they are sometimes not used. Indeed, it could be said that the designation of positions is done more to satisfy broadcasters and fans than for coaches or players, and many top coaches, including Olympic coach Mike Krzyzewski choose to ignore positions altogether. Typically, the point guard is the leader of the team when on the court. This position requires substantial ball handling skills and the ability to facilitate the team during a play. The shooting guard, as the name implies, is often the best shooter. They are probably capable of shooting accurately from longer distances. Generally, they also have good ball-handling skills. The small forward often has an aggressive approach to the basket when handling the ball. The power forward is considered to be what is called a post player or a big. A post player typically works around the basket, often with lay-ups or shots near the basket. The center is also considered a big. They work primarily around the basket, mostly shooting layups, and don't dribble the ball as often. The point guard (PG), also known as the one, is typically the team's best ball handler and passer. Therefore, they often lead their team in assists and steals. They are often quick and are able to hit shots either outside the three-point line or "in the paint", largely depending on the player's skill level. Point guards are looked upon as the "floor general" or the "coach on the floor". They should study the game and game film to be able to recognize the weaknesses of the defense, and the strengths of their own offense. They are responsible for directing plays, making the position equivalent to that of attacking midfielder in Association football, quarterback in American football, center in ice hockey, or setter in volleyball. Good point guards increase team efficiency and generally have a high number of assists. They are often referred to as dribblers or play-makers. In the NBA, point guards are usually the shortest players on the team and are mostly 6 feet 5 inches (1.96 m) or shorter. The shooting guard (SG) is also known as the two. Along with the small forward, shooting guard is often referred to as a wing because of its use in common positioning tactics. As the name suggests, most shooting guards are good shooters from three-point range. Besides being able to shoot the ball, shooting guards tend to have good ball handling skills and the ability to drive the ball to the basket, often creating their own shots off the dribble. A versatile shooting guard will have good passing skills, allowing them to assume point guard responsibilities known as combo guards. In the NBA, shooting guards usually range from 6 feet 4 inches (1.93 m) to 6 feet 7 inches (2.01 m). The small forward is considered to be perhaps the most versatile of the main five basketball positions. Versatility is key for small forwards because of the nature of their role, which resembles that of a shooting guard more often than that of a power forward. This is why the small forward and shooting guard positions are often interchangeable and referred to as wings. Small forwards have a variety of assets, such as quickness and strength inside. One common thread among all kinds of small forwards is an ability to "get to the line" and draw fouls by aggressively attempting (post up) plays, lay-ups, or slam dunks. As such, accurate foul shooting is a common skill for small forwards, many of whom record a large portion of their points from the foul line. Besides being able to drive to the basket, they are also good shooters from long-range. Some small forwards have good passing skills, allowing them to assume point guard responsibilities known as point forwards. Small forwards should be able to do a little bit of everything on the court, typically playing roles such as swingmen and defensive specialists. In the NBA, small forwards usually range from 6 feet 6 inches (1.98 m) to 6 feet 10 inches (2.08 m). The power forward (PF), also known as the four, often plays a role similar to that of the center, down in the "post" or "low blocks". On offense, the power forward is often the team's most versatile scorer, being able to score close to the basket while also being able to shoot mid-range jump shots from 12 to 18 feet from the basket. Some power forwards, known as stretch fours, have since extended their shooting range to three-point field goals. On defense, they are required to have the strength to guard bigger players close to the basket, and to have athleticism to guard quick players away from the basket. Most power forwards tend to be more versatile than centers since they can be part of plays and are not always in the low block. In the NBA, power forwards usually range from 6 feet 8 inches (2.03 m) to 6 feet 11 inches (2.11 m). The center (C), also known as the five, nicknamed the "pivot", usually plays near the baseline, close to the basket (referred to as the "low post"). They are usually the tallest player on the floor. The center usually scores "down low, in the paint" (near the basket, in the key), but some can be good perimeter shooters. They are typically skilled at gathering rebounds, contesting shots and setting screens on plays. The center position has been traditionally considered one of the most important positions, if not the most important. The range of players used in the position has transitioned from relatively slower but much taller 'back to the basket' players to players who would normally be classified as power forwards but can dominate the position with their defensive skills, or mismatch ability to shoot from the high post. This has been due to the scarcity of players possessing the combination of great skill, ideal height, and durability. This has been matched by the development of more fast-paced and athletic basketball play which calls for less traditional center play and a more up-and-down the court style. In the NBA, centers are usually 6 feet 10 inches (2.08 m) or taller. ↑ Marshall, John (1 November 2014). "Positionless basketball taking hold in college". Retrieved 18 November 2014. ↑ ^ a b Rose, Lee H. (2016). The Basketball Handbook. Point guards pass the ball on offense and then head down the floor to set up and start the play. On defense, they guard the other point guard or one of the wings. Once they receive the ball they sprint towards the basket if it is open. If not open they stand back and wait til all of their team's players are down the floor and pass the ball. If open for a shot they will shoot to score a 2 or 3 points depending on where they standing. Human Kinetics.